The feed system completes the cycle between boiler and turbine to enable the exhausted steam to return to the boiler as feedwater. The feed system is made up of four basic items: the boiler, the turbine, the condenser and the feed pump. The boiler produces steam which is supplied to the turbine and finally exhausted as low-energy steam to the condenser. The condenser condenses the steam to water (condensate) which is then pumped into the boiler by the feed pump. Other items are incorporated into all practical feed systems, such as a drain tank to collect the condensate from the condenser and provide a suction head for the feed pump. A make-up feed tank will provide additional feedwater to supplement losses or store surplus feed from the drain tank. In a system associated with an auxiliary boiler, as on a motor ship, the drain tank or hotwell will be open to the atmosphere. Such a feed system is therefore referred to as 'open feed'. In high-pressure watertube boiler installations no part of the feed system is open to the atmosphere and it is known as 'closed feed'. 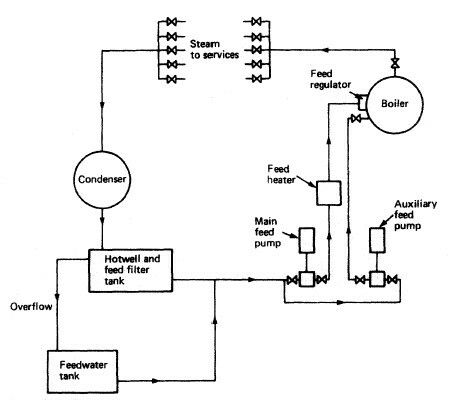 An open feed system for an auxiliary boiler is shown in Figure . The exhaust steam from the various services is condensed in the condenser. The condenser is circulated by sea water and may operate at atmospheric pressure or under a small amount of vacuum. The condensate then drains under the action of gravity to the hotwell and feed filter tank. Where the condenser is under an amount of vacuum, extraction pumps will be used to transfer the condensate to the hotwell. The hotwell will also receive drains from possibly contaminated systems, e.g. fuel oil heating system, oil tank heating, etc. These may arrive from a drains cooler or from an observation tank. An observation tank, where fitted, permits inspection of the drains and their discharge to the oily bilge if contaminated. The feed filter and hotwell tank is arranged with internal baffles to bring about preliminary oil separation from any contaminated feed or drains. The feedwater is then passed through charcoal or cloth filters to complete the cleaning process. Any overflow from the hotwell passes to the feedwater tank which provides additional feedwater to the system when required. The hotwell provides feedwater to the main and auxiliary feed pump suctions. A feed heater may be fitted into the main feed line. This heater may be of the surface type, providing only heating, or may be of the direct contact type which will de-aerate in addition. De-aeration is the removal of oxygen in feedwater which can cause corrosion problems in the boiler. A feed regulator will control the feedwater input to the boiler and maintain the correct water level in the drum. The system described above can only be said to be typical and numerous variations will no doubt be found, depending upon particular plant requirements. The steam turbine is a device for obtaining mechanical work from the energy stored in steam. Steam enters the turbine with a high energy content and leaves after giving up most of it. The high-pressure steam from the boiler is expanded in nozzles to create a high-velocity jet of steam. 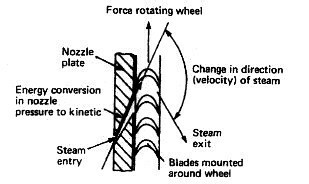 The nozzle acts to convert heat energy in the steam into kinetic energy. This jet is directed into blades mounted on the periphery of a wheel or disc (Figure above). Waste heat recovery can be carried out to produce hot water, steam or electricity from the hot exhaust gases or hot water from engines cooling system. The main candidate areas of waste heat recovery are from exhaust of the engines where the temperature is high. Also, low grade heat recovery from engine cooling system is possible and need to be considered for specific ship applications. Exhaust gas economisers are the usual waste heat recovery system currently used on many ships. More sophisticated exhaust gas steam system with steam turbine is used in larger ships; this is not normally a subject of retrofit but mostly applicable to new buildings. For ships in operation, the scope for extra heat recovery needs to be reviewed, and generally if lower grade heat is needed on-board, then waste heat recovery system could be used.